As an adult, Jordan came to mean something a whole lot more – a distant land where the ancient past still clops alongside contemporary hustle and bustle – a place where myself and two friends were very fortunate to be able to travel to in August 2011. Having never been on holiday with each other before, we spent the plane journey drawing up a list of rules for each of us to stick to in the days ahead. Things like, “Eat – as soon as anybody gets hungry” and “No moodiness” all made it into our own little Constitution, and as our Easyjet flight finally landed into Amman on that Tuesday evening, spirits were high. Jordan is a country which like many others requires tourists to obtain a temporary Visa upon landing. We used the time queuing to acquaint ourselves with the climate, which still managed to find a way to assault our skin despite it being evening and us being inside. Formalities over, we left the airport to take a bus into the centre of Amman. I found myself sat next to an American man who had been living and working in Amman and was currently returning from a trip home. He wasn’t able to brief me on much about the city, besides telling me about a place called ‘Rainbow Street’ where apparently all the action takes place, by which he could only refer to baklava stalls, leaving me none the wiser about what would really be greeting us in Amman. The bus dropped us off in the city centre and we flagged down a taxi to take us to our accommodation at the Abbasi Palace hostel. A couple of hours and one pit-stop-at-fast-food-outlet-to-grab- directions-from-the-internet later, we made it to our hostel. The next morning after a falafel-infused breakfast we set off on the bus towards the Dead Sea. 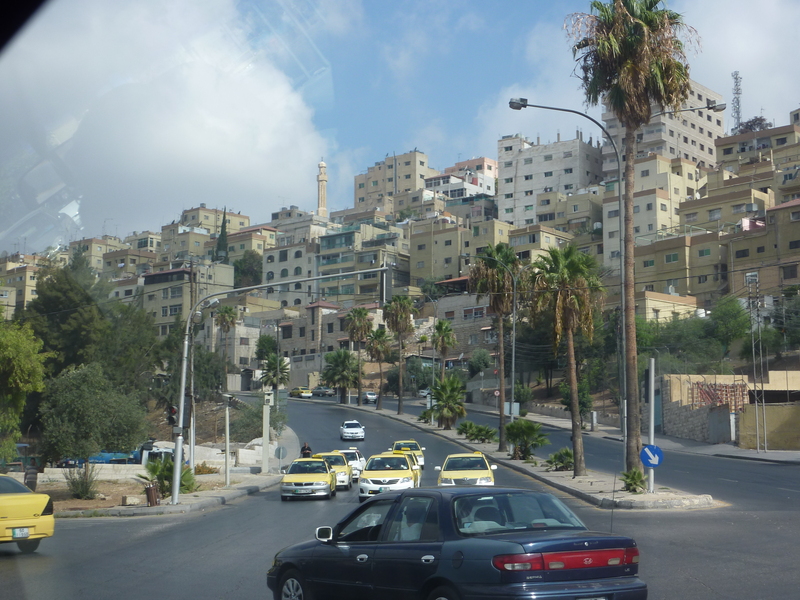 It took a while for the bus to navigate out of central Amman on account of traffic, but this only allowed us extra time with which to gaze out the windows and take in the landscape of where we were. Amman is a city of varying altitudes in which sand-coloured homes and apartments stack together like a precarious moment in Jenga, sprawling as far and high as the eye can see, but this does not last – within a few more minutes the surroundings were much more desolate – just a blank mass of barren golden hills which instantly evoked a somewhat Biblical imagery (Jordan lies on the border of Israel). The journey to the Dead Sea lasted for around an hour and a half, and our bus driver – Salem – willfully pointed out the moment at which we’d reached the official sea-level, when we still had a great 400m decline to traverse before we would reach the Dead Sea itself. The Dead Sea has been a tourist attraction for thousands of years, and as such it was no surprise when upon our approach we saw the familiar red swirly logos of ice-cream brands decked out on parasols, and huts selling brightly coloured swimming accessories. We were mesmerised by the azure shades of the water laying out before us, with Israel on the other side, and as soon as we’d changed into our bikinis we were finally sprinting out into the very worldly wonder that had brought us to Jordan. We only spent a morning at the Dead Sea. That’s all you need, but it had all been worth it, and our driver – Salem – had other things planned for us for the afternoon. 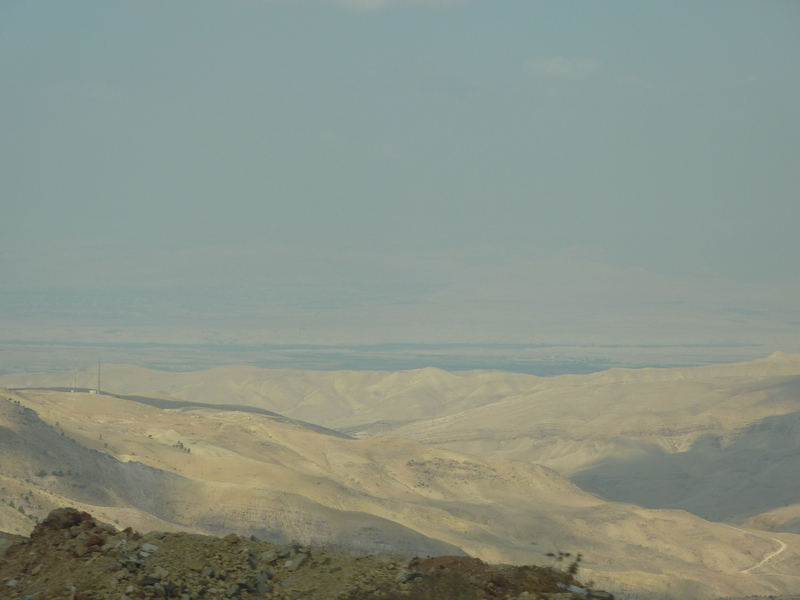 First off was Mt Nebo, an elevated ridge famed for being the site where, according to the Bible, Moses was offered a view of the Promised Land. From the peak of the ridge we enjoyed a panoramic view of the River Jordan, Palestine and Jerusalem. 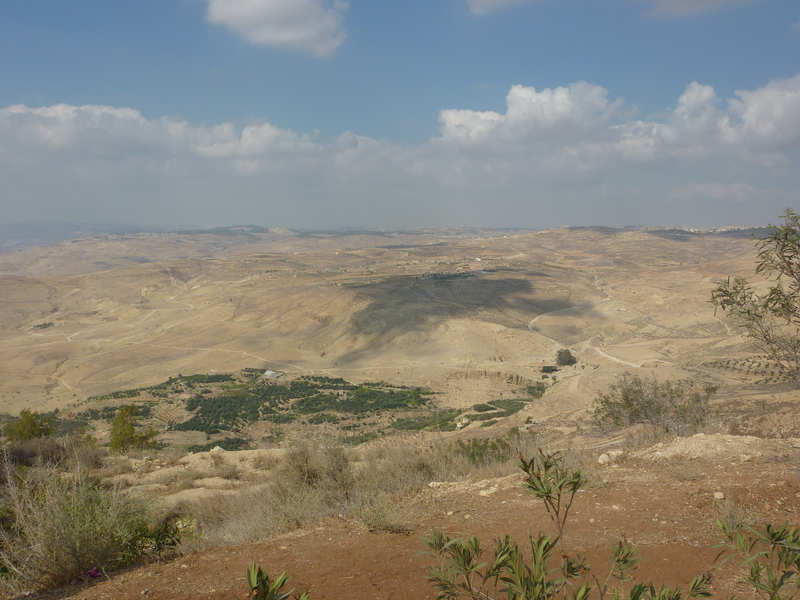 It’s been many years since I read the Bible, and I can’t claim to having ever been an ardent reader, but what little knowledge I have of the origins of Christianity was brought to a completely new life by the visuals before me – Bethlehem being an alleged 50km away. After this we took some lunch (probably falafel) before Salem drove us back to Amman, where we had time for a bit of respite before the evening’s activity. During our stay at the hostel, we had made friends with two other girls – Kathrin from Germany and Fairuz from Singapore – they had been with us on our trip to the Dead Sea and the five of us sought for a decent way to spend an evening in the city. We headed to a cafe for some dinner and then made our way to the famed ‘Rainbow Street’ to see what was on offer. There was very little of interest – granted, many Westernised noisy bars and restaurants – but nothing extraordinary. Rainbow Street at night could have easily been anywhere in the world, and in view of the lengthy day we had in front of us, we decided to call it a night. The yellow taxi barely fit us all, but between us we were limited in cash, and to split would’ve been too risky, especially in a city like Amman, where leery men stare at your deep in the eyes, so we all hunched together in a scene reminiscent of a ‘how many elephants can you fit into a Mini’ joke. The drive home was a lengthy one with multiple twists, turns, inclines and declines. Certainly, the city below us looked very pretty – a constellation of orange lights – and the driver even paused at one point to allow us to take a deeper look. Unfortunately the driver’s kindliness was short-lived. Upon arriving back at the hostel, we simply could not club together the number of Dinars that constituted our fare, and without the lingual skills with which to explain ourselves we felt that we had no option but to make a run for it. The taxi driver followed right behind us, screaming and shouting in a threatening tone. The five of us piled into a lift whilst we heard the driver screaming and banging on the other side – you can only imagine the horror when the elevator doors opened again but we had not yet left the ground! Buttons were manically pushed and after a terrifying few moments we reached the hostel lobby where the friendly faces behind the Reception desk immediately soothed us, and after a relaxing cup of peppermint tea, we forgot about the somewhat tainted end to an otherwise exceptionally enjoyable day. 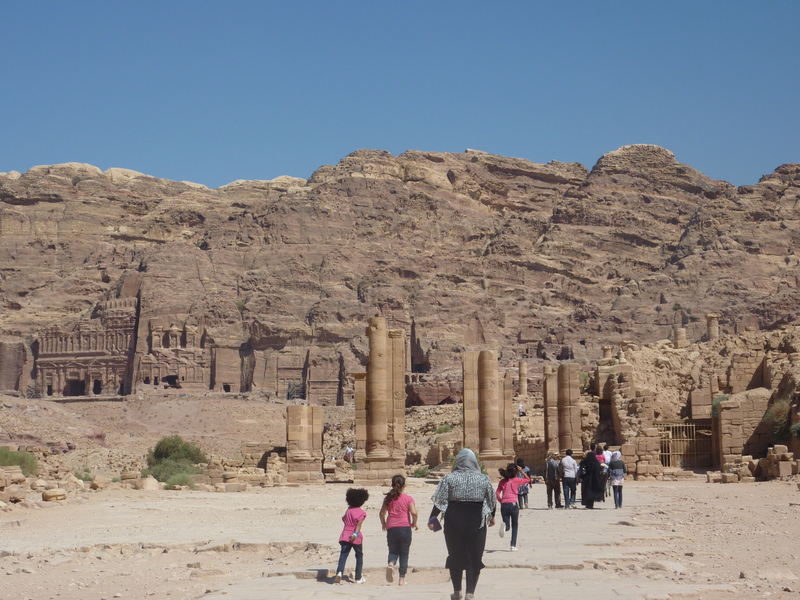 The following day was to be just as interesting, as we made our way to the historical city of Petra, all of us except Han anyway. Han opted to go to Israel for the day instead, a thought which had caused me considerable levels of concern for her safety, and I think we almost fell out over it at one point, but whilst I had had horrible images of kidnap, the reality was much less disquieting, and as I recall she spent the afternoon paragliding on the Israeli side of the Dead Sea and eating ice-cream! 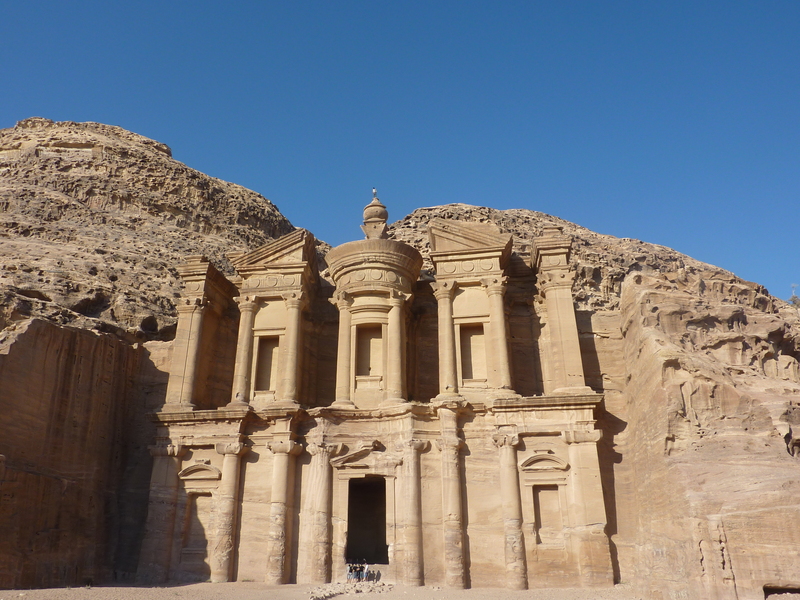 Established circa 300 B.C, Petra simply drips with history, to an extent by which it becomes almost impossible to fathom the scope of its significance through time. Visually unique – with it’s famed combination of rose-coloured buildings that are half-built and half-carved into the rock – Petra remains the home to many members of the Bedouin ethnic group, many of whom make a living by offering their camels, donkeys or horses to tourists for a temporary break from travelling on foot – which often tempted us in the sweaty August heat. It soon became apparent to us that if our visit to Petra was to be a truly enjoyable one, we would need to take plenty of breaks with which to rest and refresh. 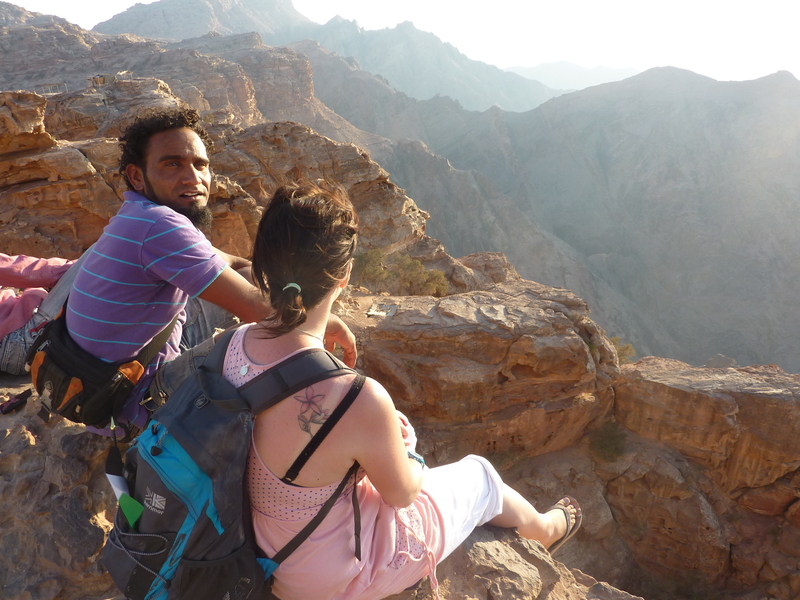 This was particularly pertinent upon our decision that we would take the trek to ‘The End of the World’ – a site virtually at the peak of the ancient city, which offered stunning views of the deserts of Wadi Rum. We made the decision to ascend the heights before us through the medium of donkeys offered to us by the Bedouins (or as Clo kept erroneously pronouncing, in deafening tones as we walked around, ‘the Boodinis’). It was a decision which left me with a lingering feeling of guilt once we had reached the top, and I can’t say that I had felt entirely safe either, as my donkey had swiftly clopped from side to side along narrow pathways that overlooked drops scaling hundreds of feet. 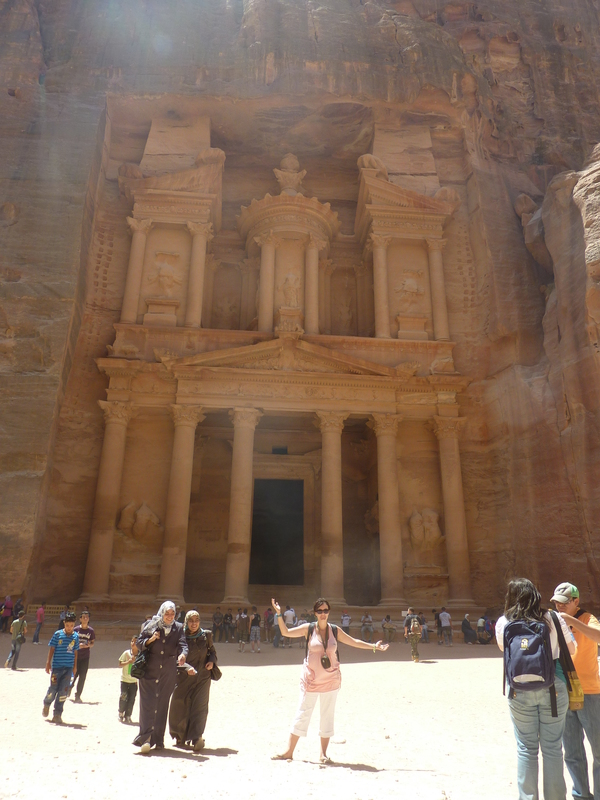 When we were all back on two feet each, I seem to recall one of the girls mentioning that she had read about tourists falling to horrid deaths in Petra – news which we were thankful to receive once we were on more steady ground! 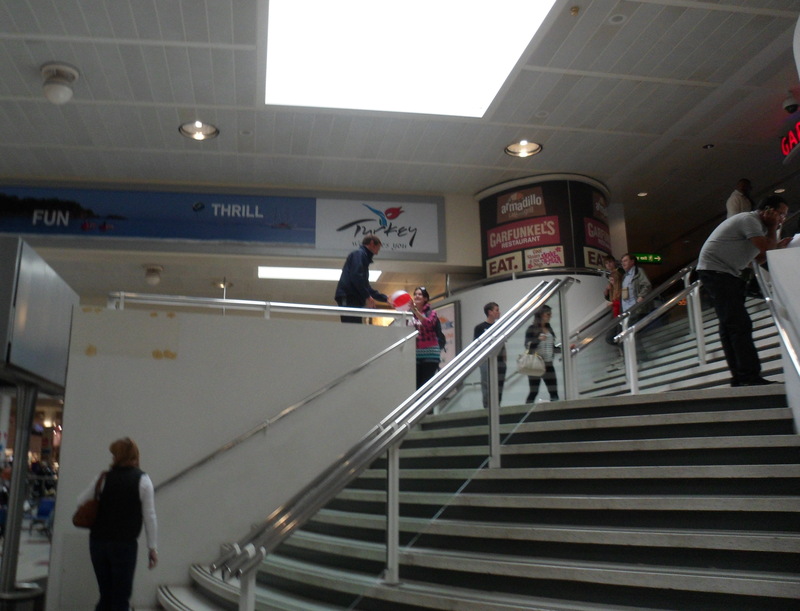 …and what was right in front of me at that point, was a lengthy walk back down to ground-level! By this time, the sky was just about starting to turn a shade of bluey-charcoal, and we knew that it would take us at least a couple of hours just to leave the site. 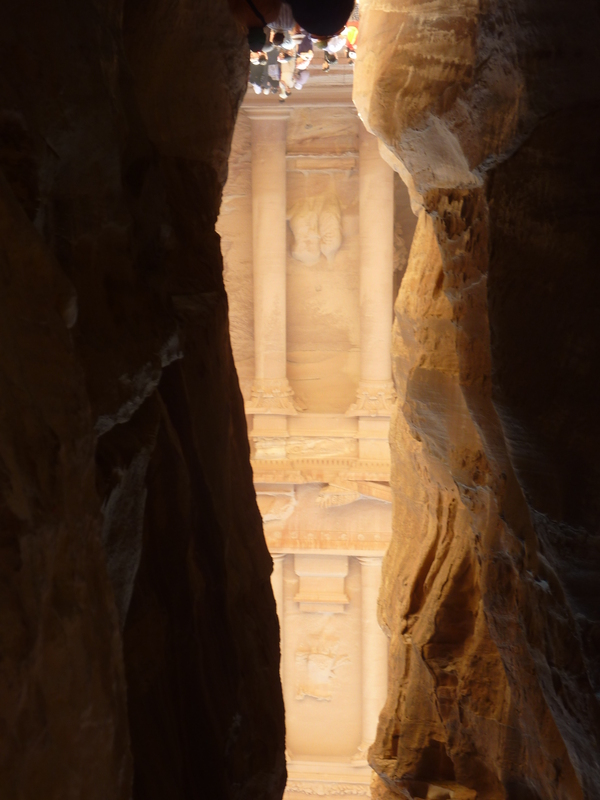 The sky had turned black by the time we had returned to the Siq (the long, winding entrance into Petra). I had taken up another Bedouin man’s offer of riding on the back of his horse, and as we rode underneath the stars he spoke to me in greater detail about life as a Bedouin – the customs, the food, the culture, what it was like to live in a cave… The impression he gave of life in the desert was one which made me wish our stay was longer so that we could have had more time to experience it first-hand. 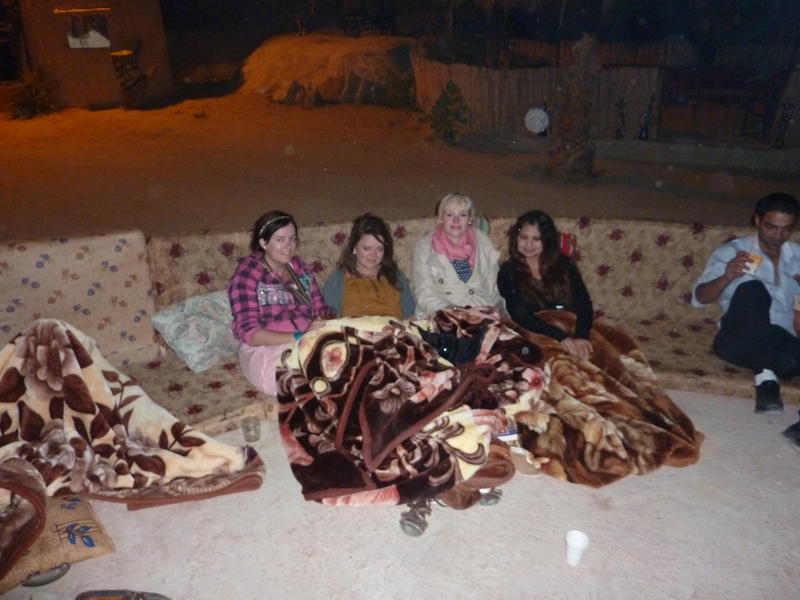 Fortunately, Fairuz had managed to source the details of a place we could stay that night that was to offer at least some of the experience – the Seven Wonders Bedouin Camp. The Seven Wonders Bedouin Camp was literally in the middle of nowhere in the great expanse of the desert, and arriving in the dark we did not have the ability to really orientate ourselves around it. Our taxi plopped us off next to the focal Campfire, which was surrounded by a circle of rugs and cushions. Next to it a wonky table stood hosting a large crackly speaker from which music was playing. The mains into which it was plugged, were the sole mains of the Camp – and we each had to take it in turns to charge up any phones or cameras that may have run out of juice from a day’s worth of photography. Accommodation was two-person huts with doors that did not fully close or lock. There were nets to protect bedding from mosquitoes, and the only source of light within the room was a candle. It was wonderful!! We spent our final evening in Jordan sitting around the campfire, looking out at the stars, speaking with one another… and the occasional bit of chat with some of the other people who were there at the time too- the Bedouins who owned it, and a particularly enthused Australian lady who had come to work at the camp and enjoyed drinking beer. It was to prove an appropriate ending for a busy couple of days in Jordan… and we all knew within ourselves, that one day we would return here….